Southeast Polk School District was experiencing tremendous growth and development, putting a strain on the current facilities and causing overcrowding in every classroom. To meet the growing needs of the community, the school district built a new high school and elementary school. 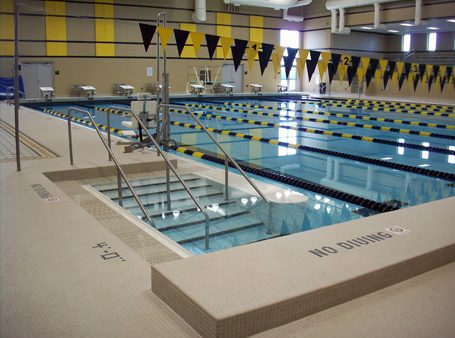 Frevert Ramsey-Kobes Architects provided architectural and engineering services for the new Southeast Polk High School while Counsilman-Hunsaker provided aquatic expertise for a natatorium, a growing trend with high schools for swim teams and swim lessons for the surrounding community. The natatorium includes an eight lane 25-yard competition pool, two 1-meter springboards, stair alcove system with ADA accessibility, and water polo capabilities.